Periodontal disease is the number one health problem in small animal patients. Periodontal disease is the number one health problem in small animal patients.1,2 However, patients generally show minimal outward clinical signs; consequently, therapy often is not initiated until late in the disease course. If periodontal disease is the number one health problem in companion animals, then it may also be one of the most undertreated diseases in this group as well. Periodontal disease has numerous local and systemic consequences. Increased incidence of oral cancer. The following facts are particularly important to share with clients to help them understand how critical both veterinary and home dental care are to the health of their pets. Periodontal disease is described in two stages: gingivitis and periodontitis. Dental calculus is calcified plaque that is also known as tartar. Once a periodontal pocket forms, the effect of supragingival plaque and calculus is minimal.3 Therefore, control of supragingival plaque alone is ineffective in controlling periodontal disease.10,19,20 This is one of the many reason why “anesthesia-free dental cleanings” are insufficient for periodontal therapy—subgingival plaque cannot be addressed adequately without anesthesia (Figure 1). In addition to halitosis and tooth loss, there are 6 severe, local sequelae of periodontal disease. The most common local consequence is an oral–nasal fistula (ONF) (Figure 2). Pathogenesis: ONFs are created by periodontal disease progressing up the palatal surface of a maxillary tooth (typically the canines), resulting in a communication between the oral and nasal cavities and creating chronic infection (sinusitis). Prevalence: ONFs are typically seen in older, small-breed dogs; however, they can occur in any dog breed as well as cats. Clinical Signs: Nasal discharge and sneezing are common signs; occasionally anorexia and halitosis may be noted. Diagnosis: Definitive diagnosis is made by introducing a periodontal probe into the periodontal space on the palatal surface of the tooth. Treatment: Appropriate treatment requires extraction of the tooth and closure of the defect with a mucogingival flap. In multi-rooted teeth, class II perio-endo abscesses are another potential consequence of periodontal disease (Figure 3). This process occurs when periodontal disease progresses toward the tip of the root and gains access to the endodontic system (usually at the apex), killing the tooth via bacterial contamination. The endodontic infection subsequently spreads though the tooth via the common pulp chamber and causes infection within the other roots. 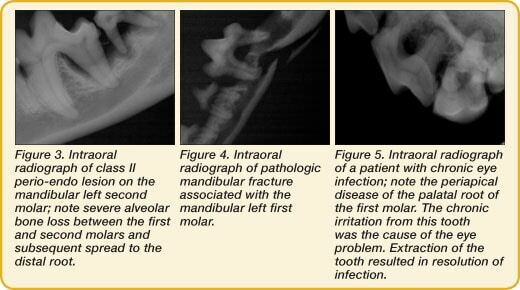 Pathogenesis: Pathologic fractures typically occur in the mandible and result from chronic periodontal loss (Figure 4). Prevalence: This condition is typically seen in toy breed dogs, mainly because their teeth (especially the mandibular first molars and canines) are larger in proportion to their mandible. Treatment: There are numerous options for fixation, but the use of wires, pins, or plates is generally required. 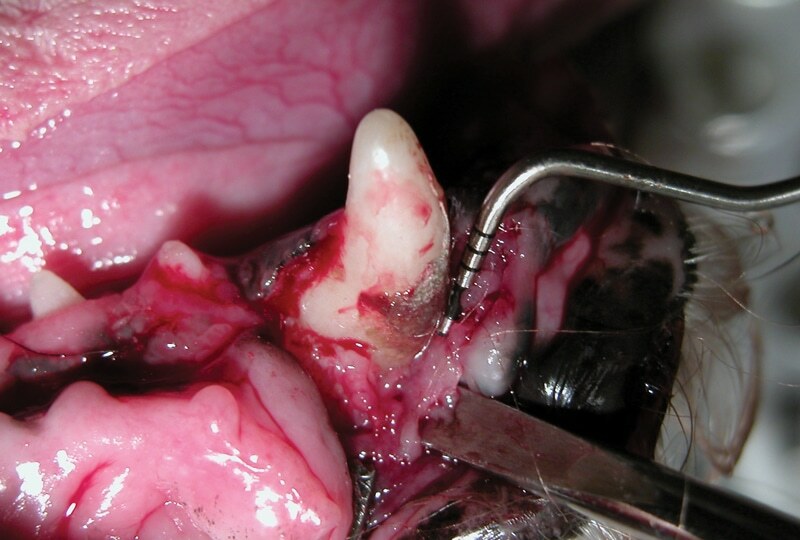 Regardless of the fixation method, the periodontally diseased root(s) must be extracted for healing to occur. Awareness of the risk of pathologic fractures can help the practitioner avoid complications in at-risk patients during dental procedures. Periodontal disease can also create inflammation close to the eye’s orbit, which can potentially lead to blindness. The proximity of the tooth root apices of the maxillary molars and fourth premolars places the delicate optic tissues in jeopardy (Figure 5). Recent studies in humans have linked chronic periodontal disease to oral cancer (Figure 6). The association in this case is likely due to the chronic inflammatory state that exists with periodontitis. Dental disease, especially periodontal disease, is the number one cause of oral osteomyelitis—an area of dead, infected bone (Figure 7). Once an area of bone is necrotic, it does not respond effectively to antibiotic therapy. Definitive therapy generally requires aggressive surgical debridement. The subgingival area provides a large surface area for bacterial exposure. In humans, it has been estimated that the surface area of the sulcal epithelium is equal to the size of the palm of the hand.21 The greater proportional size of the oral cavity (and teeth) of animal patients22 increases this surface area, which, combined with the high incidence of periodontal disease,23 means periodontal infections likely represent a more severe issue in our patients than in the vast majority of humans. The inflammation described above has been linked to numerous systemic problems, such as cardiovascular, hepatic, and renal insults.30-36 It is reported that human patients with periodontal disease are four times more likely to have multiple (3 or more) systemic maladies than those in good periodontal health.37 It is critical to note that even just established gingivitis (ie, no periodontal loss) is sufficient to create systemic consequences (Figure 8). There is evidence to suggest that periodontal therapy improves renal function in humans. Studies have shown that periodontal therapy improves glomerular filtration rate in healthy and predialysis renal patients.38,39Periodontal therapy may also provide benefits to other organs, but more research is needed. In either case, this significant evidence supports the importance of providing proper dental care to patients with mild to moderate organ dysfunction. Practitioners who are uncomfortable anesthetizing higher risk patients should utilize their local veterinary dentist and/or specialty hospital to provide the necessary dental care for their patients. Periodontal disease has been called the “silent killer.”50 Periodontal disease is lurking in patients’ mouths whether or not a veterinarian chooses to recognize it. Many clients have no idea how quickly and seriously periodontal disease can affect not just their pets’ teeth but also their overall health. In addition to treating the pet, the veterinary team needs to communicate with clients to help them understand the risks of periodontal disease and the benefits of therapy. See Communicating with Clients: Key Points for a list of facts about periodontal disease to share with clients. The following points can be shared with clients to help them realize the importance of regular dental care. By 2 years of age, 80% of dogs and 70% of cats have some form of periodontal disease. Small- and toy-breed dogs are particularly susceptible. Even after teeth are completely cleaned, plaque forms on tooth surfaces within 24 hours. One veterinary study found that pockets became reinfected within 2 weeks of dental cleaning if homecare was not performed. Research has shown that inflammation persists while the gingiva is exposed to plaque but that inflammation will resolve after plaque removal. Dental disease, especially periodontal disease, is the number one cause of oral osteomyelitis—an area of dead, infected bone. The size of the oral cavity (and teeth) of animal patients means that periodontal infections likely represent a more severe issue in veterinary patients than in the vast majority of humans. 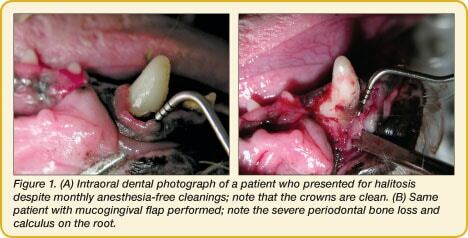 It is critical to note that even gingivitis (ie, no periodontal loss) can create systemic consequences. Avoiding professional cleanings is not good medicine, especially in pets susceptible to the negative effects of bacteremias, such as those with diabetes mellitus, renal/hepatic disease, or heart murmurs/low grade heart disease. These patients should undergo professional dental therapy due to the health benefits it provides. University of Minnesota Center for Companion Animal Health. National Companion Animal Study, 1996, p 3. Lund EM, Armstrong PJ, Kirk CA, et al. Health status and population characteristics of dogs and cats examined at private veterinary practices in the United States. JAVMA 1999; 214:1336-1341. Wiggs RB, Lobprise HB. Periodontology. Veterinary Dentistry, Principals and Practice. Philadelphia: Lippincott – Raven, 1997, pp 186-231. Hoffmann TH, Gaengler P. Clinical and pathomorphological investigation of spontaneously occurring periodontal disease in dogs. J Small Anim Pract 1996; 37:471-479. Quirynen M, Teughels W, Kinder Haake S, Newman MG. Microbiology of periodontal diseases. Carranza’s Clinical Periodontology. St. Louis: WB Saunders, 2006, pp 134-169. Löe H, Theilade E, Jensen S. Experimental gingivitis in man. J Periodontol 1965; 36:177-187. Rober M. Effect of scaling and root planing without dental homecare on the subgingival microbiotia. Proc European Congress Vet Dent 2007; pp 28-30. Lindhe J, Hamp S, Löe H. Plaque induced periodontal disease in beagle dogs: A 4-year clinical, roentgenographical and histometrical study. J Perio Res 1975; 10:243-255. Boyce EN, Ching RJ, Logan EI, et al. Occurrence of gram-negative black-pigmented anaerobes in subgingival plaque during the development of canine periodontal disease. Clin Infect Dis 1995; 20:S317-S319. Debowes LJ. Problems with the gingiva. In Niemiec BA (ed): Small Animal Dental, Oral and Maxillofacial Disease: A Colour Handbook. London: Manson, 2010, pp 159-181. Fiorellini JP, Ishikawa SO, Kim DM. Gingival Inflammation. Carranza’s Clinical Periodontology. St. Louis: WB Saunders, 2006, pp 355-361. Carranza FA, Takei HH. Rationale for periodontal treatment. Carranza’s Clinical Periodontology. St. Louis: WB Saunders, 2006, pp 630-635. Van Dyke TE, Serhan CN. Resolution of inflammation: A new paradigm for the pathogenesis of periodontal diseases. J Dent Res 2003; 82:82-90. Silness J, Löe H. Periodontal disease in pregnancy II. Correlation between oral hygiene and periodontal condition. Acta Odontol Scand 1964; 22:121. Klokkevold PR, Mealey BL. Influence of systemic disorders and stress on the periodontium. Carranza’s Clinical Periodontology. St. Louis: WB Saunders, 2006, pp 228-250, 284-310. Grove TK. Periodontal disease. Compend Cont Ed Pract Vet 1982; 4(7):564. Novak MJ. Classification of diseases and conditions affecting the periodontium. Carranza’s Clinical Periodontology. St. Louis: WB Saunders, 2006, pp 100-109. Niemiec BA. Periodontal disease. Top Companion Anim Med 2008; 23(2):72-80. Westfelt E, Rylander H, Dahlen G, Lindhe J. The effect of supragingival plaque control on the progression of advanced periodontal disease. J Clin Periodontol 1998; 25(7):536-541. Page RC. The pathobiology of periodontal diseases may affect systemic diseases: Inversion of a paradigm. Ann Periodontol 1998; 3:108. Gioso MA, Shofer F, Barros PS, Harvery CE. Mandible and mandibular first molar tooth measurements in dogs: Relationship of radiographic height to body weight. J Vet Dent 2001; 18(2):65-68. Nisengard RJ, Kinder Haake S, Newman MG, Miyasaki KT. Microbial interactions with the host in periodontal diseases. Carranza’s Clinical Periodontology. St. Louis: WB Saunders, 2006, pp 228-250. Scannapieco FA. Periodontal inflammation: From gingivitis to systemic disease? Compend Contin Educ Dent 2004; 25(suppl 1):16-25. Mealey BL, Klokkevold PR. Periodontal medicine: Impact of periodontal infection on systemic health. Carranza’s Clinical Periodontology. St. Louis: WB Saunders, 2006, pp 312-329. Takai T. Fc receptors and their role in immune regulation and autoimmunity. J Clin Immunol 2005; 25:1-18. American Academy of Periodontology. Mouth body connection. Available at: perio.org/consumer/mbc.top2.htm. Harvey CE, Shofer FS, Laster L. Association of age and body weight with periodontal disease in North American dogs. J Vet Dent 1994; 11:94-105. Hoffman TH, Gaengler P. Epidemiology of periodontal disease in poodles. J Small Animal Pact 1996; 37:309-316. Pavlica Z, Petelin M, Juntes P, et al. 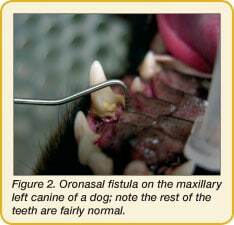 Periodontal disease burden and pathological changes in the organs of dogs. J Vet Dent 2008; 25(2):97-108. Debowes LJ, Mosier D, Logan E, et al. Association of periodontal disease and histologic lesions in multiple organs from 45 dogs. J Vet Dent 1996; 13(2):57-60. Franek E, Blach A, Witula A, et al. Association between chronic periodontal disease and left ventricular hypertrophy in kidney transplant recipients. Transplantation 2005; 80:3-5. Taboada J, Meyer DJ. Cholestasis is associated with extrahepatic bacterial infection in five dogs. J Vet Intern Med 1989; 3:216-220. Center SA. Hepatobilliary infections. In Green CE (ed): Infectious Diseases of the Dog and Cat. Philadelphia: WB Saunders, 1990, pp 146-156. Cullinan MP, Ford PJ, Seymore GJ. Periodontal diease and systemic health: Current status. Aust Dent J 2009; 54(supp 1):S62-S69. Al-Emadi A, Bissada N, Farah C, et al. Systemic diseases among patients with and without alveolar bone loss. Quintessence Int 2006; 37(10):761-765. Artese HP, Sousa CO, Luiz RR, et al. Effect of nonsurgical periodontal treatment on chronic kidney disease patients. Braz Oral Res 2010; 24(4):449-454. Graziani F, Cei S, La Ferla F, et al. Effects of nonsurgical periodontal therapy of the glomerular filtration rate of the kidney: An exploratory trial. J Clin Periodontol 2010; 37(7):638-643. Jansson L, Lavstedt S, Frithiof L. Relationship between oral health and mortality rate. J Clin Periodontol 2002; 29:1029. Avlund K, Schultz-Larsen K, Krustrup U. Effect of inflammation in the periodontium in early old age on mortality at 21-year follow up. J Am Geriatr Soc 2009; 57(7):1206-1212. Geerts SO, Nys M, De MP, et al. Systemic release of endotoxins induced by gentle mastication: Association with periodontitis severity. J Periodontol 2002; 73:73. Guntheroth WG. How important are dental procedures as a cause of infective endocarditis. Am J Cardiol 1984; 54:797. Hartzell JD, Torred KP, Wortmann G. Incidence of bacteremia after routine tooth brushing. Am J Med Sci 2005; 329:178-180. Glass RT, Martin ME, Peter LJ. Transmission of disease in dogs by toothbrushing. Quintessence Int 1989; 20(11):819-824. Dajani AS, Taubert KA, Wilson W, et al. Prevention of bacterial endocarditis: Recommendations by the American Heart Association. JAMA 1997; 27:1794. Miller LS, Manwell MA, Newbold D, et al. The relationship between reduction in periodontal inflammation and diabetes control: A control of 9 cases. J Periodontal 1992; 63:843. Promsudthi A, Pimapansri S, Deerochanawong C, Kanchanavasita W. The effect of periodontal therapy on uncontrolled type 2 diabetes mellitus in older subjects. Oral Disease 2005; 11:293-298. Taylor B, Tofler G, Morel-Kopp MC. The effect of initial treatment of periodontitis on systemic markers of inflammation and cardiovascular risk: A randomized controlled trial. Eur J Oral Sci 2010; 188(4):350-356. Mealey BL, Klokkevold PR. Periodontal medicine: Impact of periodontal infection on systemic health. Carranza’s Clinical Periodontology. St. Louis: WB Saunders, 2006, pp 170-192. Brook A. Niemiec, DVM, FAVD, Diplomate AVDC, is chief of staff of Southern California Veterinary Dental Specialties, with offices in San Diego and Murrieta, California, and Las Vegas, Nevada. He has authored many articles and chapters, including the recently published Small Animal Dental, Oral and Maxillofacial Disease: A Colour Handbook (Manson Publishing). Dr. Niemiec founded the veterinary dental telemedicine website vetdentalrad.com, which also offers instructional videos and educational posters. He lectures extensively at national and international conferences and is the coordinator and instructor of the San Diego Veterinary Dental Training Center (vetdentaltraining.com). Dr. Niemiec received his DVM from University of California–Davis.